When most people think of the roof over their heads, the first things that come to mind are the asphalt or slate shingles and maybe even the sheathing that was used as a foundation, but the valleys in your roof need to be considered as well. Having some knowledge about what material to stay away from and what material will last is important. Starting with a backup layer is a good idea and here granulated peel and stick membrane makes for a watertight base and a safe surface to walk on. This material comes with a peel and stick backing which needs to be removed before the membrane is placed under the existing shingles. 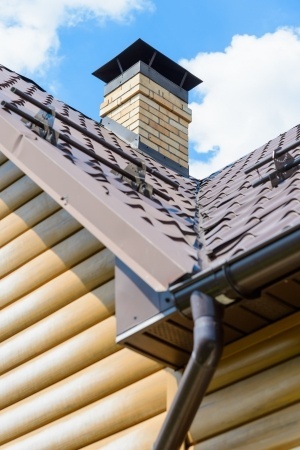 Metal flashing are the best choice for the valleys in your roof and it’s important to have the right tools so you can bend the flashing over the drip edge to prevent water from freezing up high under the shingles in the winter. Generally there are two different types of flashing when it comes to the valleys in your roof and some roofers prefer the W-type flashing over the V-type flashing simply because the extra ridge prevents the material from bending when it’s being carried. The shingle cuts that go over the metal need to be tapered at the bottom since that’s the part of the valleys in your roof that handle the most water. This entry was posted in Roofing Structures and tagged Roofing, Roofing Valleys, Roofs, Valleys. Bookmark the permalink.